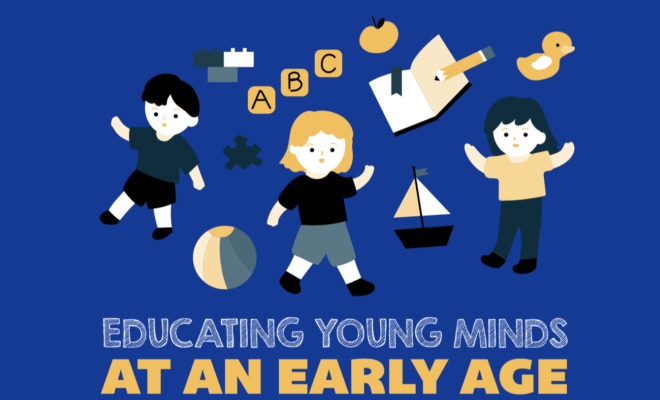 Studies show that early childhood education has a tremendous impact on student life outcomes. Young children are like learning sponges, and as such, every new experience, every word they learn and behaviors they are exposed to can make a lasting impression on their academic success. Continuing its mission to provide high-quality education at an early age, Pharr-San Juan-Alamo ISD is one of few districts in the Rio Grande Valley currently leading the way in early childhood education through its innovative Pre-Kinder 3 and Pre-Kinder 4 program at schools and partner day cares. As part of the program, 3- and 4-year-old students enrolled can receive school readiness instructional support to ensure they are prepared for school. Thanks to partnerships with over 40 local day cares, parents of 3-year-olds can choose to have them attend full-day at these facilities for a fee or attend the district’s in-house half-day Pre-K 3 program offered at all elementary schools. Through their participation in this program, all participants receive instruction from certified PSJA ISD teachers. 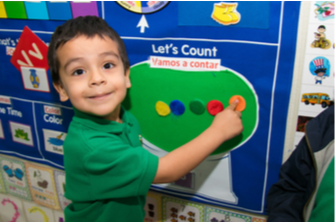 According to PSJA Early Start Pre-K School Principal Consuelo Casas, partnerships through the local day cares in the area allow the day care staff to receive training and guidance from PSJA’s certified teaching staff in order to provide instruction to their student body and ensure students are ready for kindergarten. “The program is one of the biggest assets we have in our school district as we’re giving our students a very early start on their road to success,” Casas said. Since its launch with PSJA in 2017, the collaboration has benefited families, the district, and the day cares. One such success includes the Little School House Learning Center in San Juan, one of the PSJA Partner Day Cares that was recently named a Texas Rising Star (TRS) Four-Star certified facility. Macarena Chavez, owner and director of Little School House Learning Center, describes the partnership with PSJA as an important component in earning the TRS Four-Star certification. The Texas Rising Star program is a voluntary, quality-based child care rating system of child-care providers participating in the Texas Workforce Commission’s subsidized child-care program. The TRS Provider certification system offers three levels of certification (Two-Star, Three-Star, and Four-Star) to encourage providers to attain progressively higher certification requirements leading to a Four-Star level. Thanks to this success, PSJA ISD’s innovative collaboration has garnered the attention of nearby districts who are now interested in developing similar programs. 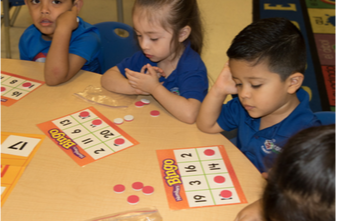 In addition to the Pre-K 3 program, 4-year-old students can also be enrolled in the district’s full-day Pre-K 4 program available at all 25 elementary schools. This program does not have any eligibility requirements except for students to be 4 years old by Sept. 1. 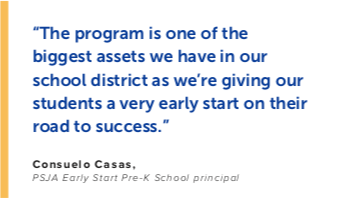 According to Casas, offering a Pre-K 3 and 4 program is invaluable for families as they help provide a solid foundation for lifelong learning.